What makes a Tamil wedding unique? Tamil weddings are simple yet elegant. Tamil weddings are diverse; different classes follow different traditions but some of them are followed by all classes. Most wedding ceremonies are conducted in the early hours of the morning and the reception is conducted in the evening which gives the newlyweds a sufficient break between the two ceremonies. When you attend a Tamil wedding, you tend to be drawn to the rich colours of red, saffron and gold which are symbols of sensuality and purity, almost like a royal affair. Tamil weddings are rich in rituals and Tamilians give a lot of importance to the way they are performed and in what order. The entire affair, from fixing the date on the basis of an auspicious day according to the Hindu calendar to the actual wedding ceremony, is grounded in the ancient sacred texts of Hinduism known as the Vedas. Verses from the Vedas are chanted as a part of various rituals throughout the wedding ceremony with the intention of bringing happiness and peace to the couple. Weddings are a big family affair in the Tamil culture. Relatives, close and distant, come together with great enthusiasm to shower best wishes for the newlyweds. Invitation is often extended to friends and neighbours giving a Tamil wedding more of a community feel. What are the 5 things you need to know before attending a Tamil wedding? #1 Except a lot of rich colours everywhere- it is all about beautiful Kanchipuram silk sarees, gold jewellery and bright flowers. #2 There will be a lot of guests- 250 to 350 on an average. Most guests attending the wedding wear traditional clothes and jewellery- honouring traditions is a big part of the Tamil culture. #3 Food is a big part of a Tamil wedding. There will be a surfeit of South Indian vegetarian food to satisfy your hunger and your senses. #4 If the wedding is of a close friend or relative, expect to be a participant in the many of the rituals, for example the Vratham, Nichyadartham and KasiYatrai ceremonies. #5 Be prepared to attend a few days of ceremonies. A traditional Tamil wedding can last anywhere between 3 to 7 days. If you would like to read more about the details of the ceremonies in a traditional Tamil wedding, check out this page dedicated to Tamil matrimony by iMarriages, which is a premium matrimony company that predominately serves South India. Completely free to use and with a personality matching system designed by registered doctors, you should definately consider them if you or your son/daughter are looking for a life partner. Tamil culture is one of the oldest cultures in the world with origins dating back to more than 2000 years. Tamil as a language has deep roots in the culture, traditions and way of life of people who live in various parts of India, Sri Lanka, Malaysia and many other countries across the globe. Tamil is one of the Dravidian languages of southern India and Tamilians have a lot of attachment for their language and culture. The culture has not changed since its inception. 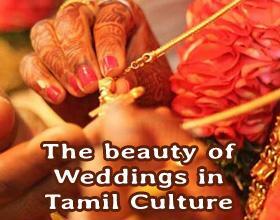 Tamil weddings are rich, vibrant and laced with customs and traditions which are reflective of the culture. தமிழர் திருமணம் பற்றிய கருத்துக்கள் மிகவும் சிறப்பு.